Work took me to the University of Pennsylvania campus last week, so I spent some time wandering places familiar and new. I have alumni access to the Van Pelt Library and took the opportunity to see all the changes on the sixth floor. It's practically unrecognizable. I appreciate the large glass windows and lounge seating, but I miss the coziness of the old Shakespeare library, with its vintage chandeliers and slightly shabby air. Still, I admit the views of Center City from the new terrace windows are amazing, even on overcast November afternoons. I stood in a little alcove and sketched the view as the clouds blanketed the buildings. 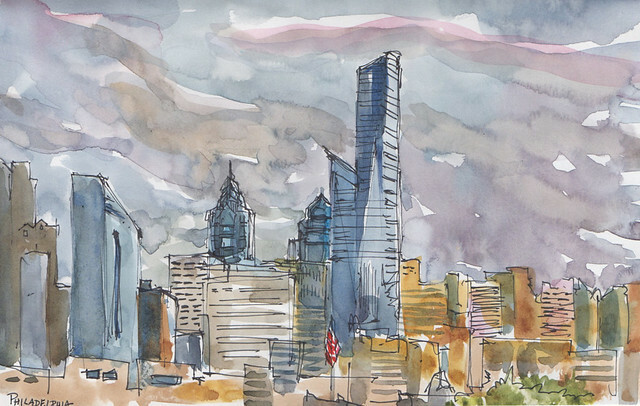 It's odd to think that during my years there, the skyline's defining shapes were the tops of One and Two Liberty Place, and their construction was controversial because they were higher than the statue of William Penn above City Hall. Now Philadelphia is a veritable forest of skyscrapers, with the forthcoming Comcast Technology Center slated to become the tallest building in the U.S. outside New York and Chicago. Wow.